My first published creative pieces were short stories that warped in some way from my own life. I didn’t realize the generative power of research and assumed that for historical fiction, you read sources and took notes, rather as for a term paper, searching for factoids to plug into a frame, as if the creative process were somehow different from the research process. I’m not so sure now. For example, as I begin roughing out my third novel, I’ve got a character who is German in New Jersey just before World War I. I wanted to give him a dog. Maybe a German Shepherd (why not?). So for distraction I read about German Shepherds. That was fun. 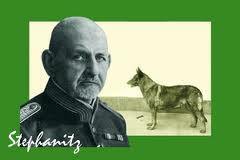 I found out that the breed was created by former cavalry officer Max von Stephanitz from Berlin who had acquired a working dog in 1899 and conceived of a new breed derived from this one male: intelligent, strong, courageous, agile, territorial, tempered for constant work, loyal and obedient. He began a process of judicious breeding and inbreeding with a discrete admixture of wolf blood, eliminating with extreme prejudice any offspring that strayed from his ideal. It wasn’t until 1919 that the German Shepherd was registered in kennel clubs. Therefore it’s quite possible that in a small town in the U.S before the war some people would never have seen a German Shepherd. Imagine their astonishment: an animal so powerfully wolf-like and yet obeying his master like a dog. Did that master have some special power? You could easily think so if you’d never seen Rin Tin Tin. So this research opened up a line of both character and plot and now the dog element is getting bigger in my story. Of course the risk, the lure is to go on and on with research and never start to write. Sooner or later, the fingers have to hit the keys.